This one-of-a-kind resource provides a rich set of benchmarks and data to compare your engineering program’s patenting, tech transfer, and sponsored research efforts against university programs worldwide. With this all-new report you’ll find detailed data on promoting technologies, managing patents, sponsored research opportunities, incentivizing staff for IP creation, and publicizing university research. You’ll also find detailed data on financial support for promoting and managing university technology transfer and sponsored research. This study is jam-packed with dozens of easy to scan charts and figures displaying critical data you can’t find in any other publication. See how your engineering program compares and identify key areas for improvement! Unlike any other available resource, International Survey of Engineering Faculty & Administration: View of University Efforts to Promote Technology Transfer, Patents & Sponsored Research provides you with an in-depth look into key data so you can compare your practices and see how you stack up against other engineering programs – and use the data to point you to areas for improvement. Data in the report is broken out by engineering program ranking, academic title, field of engineering, tenure/professional status, level of compensation, gender, US/Non-USA and other variables. You can rely on the accuracy of the detailed data, commentary, and analysis provided in this informative report. It was compiled and written by James Moses, President of Primary Research Group. Mr. Moses is the author of hundreds of industry studies and benchmarking reports and is a former economist for the U.S. International Trade Commission. 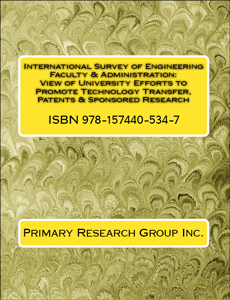 International Survey of Engineering Faculty & Administration View of University Efforts to Promote Technology Transfer, Patents & Sponsored Research is available to purchase for the low price of just $295, and is available in print or PDF. You can also make this invaluable resource available to your entire staff with an economically priced site-license purchase – just $450!